Not the best picture as far as showing off the goods, but I think it's funny. 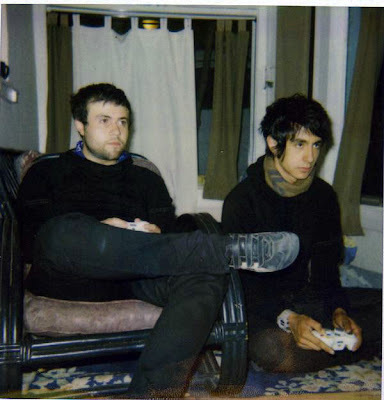 Close cropped and shaven Daniel and Chris playing Oblivion at Zac, Meg, Eric and Dylan's house summer/fall 2007. This is from the first cowl-necked hoodie pattern I made. They are each made from tricot (or some other knit... can't remember...) with gold zig-zag top stitch around the sleeves. The hoods are each lined with a different fabric. Daniel has a blue nautical print, Chris's is a gold-flecked black. Chris is wearing a scarf with his. It's only been a few years but they both look really young in that picture. Maybe it's just the zombie-gamer glaze in both of their eyes. That and the cheeks.